Blog What does it take to be a successful Part 107 Pilot? DLP Radio Interview of Ron Angle. What does it take to be a successful Part 107 Pilot? DLP Radio Interview of Ron Angle. What does it take to be a successful Part 107 Pilot? If you are looking to build your drone service business, you need to understand what the playing field looks like today, as well as where the drone service market is headed in the future. The best way to understand what it takes to make it in this industry is to speak to those that are now professionals in the UAV market. We interviewed Ron Angle of Angle Drone Solutions to find out his perspective on what it takes to be a professional and successful drone business pilot. Welcome to DroneLawProRadio. This is dronelaw.pro. We are Part 107 pilots become Part 107 professionals. Here is your host Drone Attorney Enrico Schaefer. ENRICO: This is Drone Attorney Enrico Schaefer and we are here at InterDrone 2018. We are going to be finding out from the folks who are here at the conference what is happening in the field. What is going on at sUAS in the real world. What is going on in the drone market in the real world, from the drone pilot perspective from the customer perspective? Today we are sitting with Ron Angle from Angle Drone Solutions in Illinois. Ron, tell us a little bit about your company, your website and what kinds of things you are doing in drone operations. 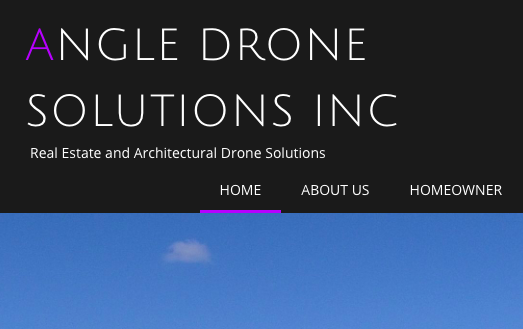 RON: The name of the company is Angle Drone Solutions, the website is www.angledronesolutions.com. I always tell people that if they are going to my website, there is a link to my Facebook page. Go to my Facebook page because that has the most recent information. My website is update as of August, but the Facebook is up to date as of last week. ENRICO: Exactly, now that is interesting, because while we really have seen in this space because it is new, is this gravitation towards social media and social media marketing. A website, you have a web developer, you put your website on line, every time you want to change it, you have to go back to your web developer. Where as Facebook, LinkedIn, Twitter, you can add your own content, you can let people know what is going on, what kind of projects you are involved in. I think one of the advices I always give to folks who are coming in to this space, in to the sUAS space is go and get connected on social media, to the groups and to the people who are already doing drone services. They would be happy to share information about how to be a successful drone service provider and that is really where the meat can be found. I am glad to hear that is where you are putting your content as well. RON: Absolutely. You asked about what my focus is, really right now, the focus is working with realtors on getting pictures for the MOS listing. I am working in the commercial sector where different companies have approached me and asked for pictures so that they can use them for their Facebook pages as well as for their websites. I have been working with the local municipality for economic development boards. For them to be able to show different properties that are open, that they want to be able to show what the relationship with these properties are to different features of the areas such as, how is this close is this to Route 80? How close is this to the major shopping centers? We want people to get an idea of exactly where these properties are located because they may not be local people. They may be marketing these properties to people that are hundreds of miles or thousands of miles away. ENRICO; That is really interesting because in the drone space a picture does speak a thousand words. When you can see something, you don’t have to explain it and it is easier to show and the interesting thing about drones has always been that we are seeing things from perspective that no one has ever taken a picture, video from before unless they have the money to hire a helicopter. Right? So, in all the different markets that you are in, it is really the most straightforward ROI for the folks. They are getting the benefit of being able to, in the real estate space, market their property in a way that is much more visual, much more compelling that is going to close more deals, to sell more properties and put more money in their pocket. On the municipal, they need to be able to show to meetings, to others, to internally what relationships are between properties, and there is no better way to do it by drone of course, and commercial space where people may have a building or what have you, that they want to show off. There is no better way to do drone photo and put it in their marketing material on their website and social media. RON: Absolutely. Moving on to market differentiation. One of the things that I find that really differentiates me is having the aviation background. Before I got involved in model aviation, I was actually in private aviation for about 20 years– manned aviation During that timeframe, I did various things but one of the most important things that I did was I became a chief flight instructor for glider operations both for a club as well as a commercial operation. So, I had to have a safety mindset to be able to do those things. I had to understand different people’s capabilities, when was it safe for them to fly as oppose to when it was for me to fly. You had to have this mindset of risk mitigation that many people that have just gotten into the drone industry have not developed that mindset so the first thing that I think differentiates me is I have a risk mitigation mindset and when I approach a job, I am focusing on what are the risks and how can I minimize them for both me as well as for my customer. ENRICO: And that is what the FAA expects. I always tell folks there is two really interesting types of people that come in to this space that have an immediate advantage. The first is people who come from the aviation because they understand the FAA, they understand how the FAA works, they understand in general the process they are going to have to go through to get permissions, to do inspections, the importance of checklists, how the FAA use drone operations from a safety and risk management point of view and those folks people like you Ron, you have the advantage of being able to market that to your customers. One of the things that the drone market faces is that the customers don’t understand enough to know what question to ask or appreciate the market differentiators. Right? If Ron Angles coming in to be able to do this service and is going to charge “x” and do it professionally, that is going to be one price. To hire the kid next door who bought a drone, is obviously always going to be cheaper. Educating customers about why it is important to hire professional drone service providers and why they have risk if they don’t hire professional drone service providers and pilots, is what is happening right now in the market and what needs to happen in order to support professional pricing. RON: Absolutely. Some of the other things I think differentiate me is again, talking about how people have come in to the drone industry in just the last couple of years. I actually flew model helicopters for over a dozen years before drones came out. I also started flying some of the first drones that were available. The first drone I flew was a Gowie 300, this Gowie 300 had a stabilization system that was terrible. You got a little bit of wind, you were off to the races trying to control it, if you were not a good pilot. I learned to fly on that and slowly came up through the system to now we have these great stabilization systems, but I know how to fly. ENRICO: You can’t get the shot, if you don’t know how to fly. That is the other thing that people sometimes fail the realize the customers fail to appreciate which is it is easy to put a drone in the air and connect it to 16 satellites. It is really hard to fly the drone in a way that is going to be able to get the shots you need, especially when you are doing real estate where you are doing video. And you are maneuvering through the property in a way that is just smooth flight path that is putting the drone in the right positions and so being a really being a good drone pilot is rare in this business and is definitely as market differentiator. RON: The last thing I want to talk about is the ox in the box. The fact that that has encouraged me to do things like notifying neighbors and also just all the different forms, and making sure I am covering the things I need to cover such as my copyrights, such as things like if I hire a secondary pilot, I have the rights for those pictures covered so that there is never a dispute and never becomes a problem again for my end customer. ENRICO: Right, you are speaking my language now first because one of the things that we saw very early, the industry failed to appreciate that; yes, they are flying drones, but part of the core business is copyright ownership, copyright licensing, and sometimes copyright assignments. You got data, photo, video. You are licensing those to the customer. Hopefully you have the ownership rights as the drone service provider to be able to license and there is the upstream and downstream copyright problem. The other aspect is professionalism. So, we have already talked about that. But having the right business documents and contracts that scream professional help support that price. RON: Absolutely. Now let’s move on to your next question which was the five-year plan. ENRICO: What is your five-year plan? One of things that is really fascinating is, the people who been in the space who are still in the space who are weathering perseverance, who are weathering the slowness of the FAA to grant authorizations and waivers who are weathering the fact that the market customer demand always comes slowly, perseverance being the number one differentiator between success and failure, right? We have made it this far, what is the five-year plan for your business? RON: For me, I look at is I have a one year and I have a five year. My one year is I want to get to the point where after a year, I am no longer a part-time business. At this point I am still struggling to become a fulltime business. By next year, I want to be to the point where I am a fulltime business. ENRICO: That problem is a customer demand issue. Right? Now you have to go out and tell people why they want to hire you. That is not market demand. Market demand is the phone is ringing, and they are looking for you and they understand what they are looking for. We are not there yet. That is why you have seen this kind of hype which drove the initial market and then reality of the FAA and now we are now into reality of the fact it takes a while for the customer, the end user of the services to be able understand enough to be able to appreciate enough, to hire it and pay professional pricing for it. RON: Exactly. Now once we get to the five-year plan, we have two things that we have to consider. One is of course I would like my business to grow, I like it to be to the point where I have possibly 3 to 5 people on staff, a couple of pilots, a scheduler and possibly somebody to help with graphics so that I have somebody that is actually doing the editing so I can remove myself from the editing and I can be doing more of the flying, marketing or scheduling type of aspects. The second side of that we have to think about what technologies are we going to be using in five years. This space is growing and changing extremely rapidly. And one of the things that I am really considering right now is right now we are focusing more on quadcopters for the types of work that I am doing. But I am thinking that within five years, if I am working on construction, and I’m working on larger areas, I am going to be looking at a vertical lift horizontal flight type of vehicle. Because I am going to need to cover larger area quickly and that is the only way to do it effectively. ENRICO: That is a great point. Which is that whatever technology was are using today will not be the technology we will be using in three to five years. If you want to be a drone pilot Part 107 certified and offer drone services, you have to keep up with the technology. A lot of folks such as yourself, building the foundation to be in a position to take advantage of that market demand as it continues to evolve, and when the market demand comes, there is going to be people who have been standing there a long time, who knows what they are doing rather than trying to figure out what they are doing and that will be important. RON: Right, and that is a part of being an interdrone, and that is part of being some of the other training program. Recurring training is part of that five-year plan because if you don’t constantly keep training, you are falling behind. ENRICO: The last question I have for you Ron Angle is what is it that you are seeing in terms of customers when you go out and pitch those customers and you are saying, here is what I can do for you? A year ago, 2 years ago, the industry was at a certain point, now we are at an evolved point. Somewhat of an evolved point. Knowing that customer demand is the next thing that has to happen, are you seeing any changes on the customer end how they understanding, appreciating, embracing drone technology and commercial drone operations. RON: I am starting to see a slight shift. The realtors are starting to say, yes, we need some more drone photography because everybody else is starting to use it and it is starting to become more of a norm rather than the exception. A large part of the photography that I have done this year has been for bigger properties where they realize, hey, I need a good picture of this large property to be able to really describe it fully to people –these snap shots of different portions of the property are just is not doing it. I am finding that some people in the construction industry, I have talked to a couple builders recently, and they are very much on board in terms of thinking about geez that would be great to have somebody who could document our building process and be able to show people what it looks like for their house to go up. So there is some possibilities in the future of that growing as well. I am finding that people are starting to understand what drone pictures can do for them. But there is still a lot of people that are not are aware of all of the other technologies. There are a lot of people that still do not understand drone mapping, there are a lot of people that still do not understand 3D technology that we can offer them. There is still a challenge in that area. From a drone photography stand point, we are starting to make some good end roads. ENRICO: Ron Angle, from Angle Drone Solutions in Illinois. Thanks for sharing your insights and expertise today. Thank you for joining Drone Law Pro Radio. You have been listening to Drone Law Pro Radio. Visit us as www.dronelaw.pro. Do not forget to subscribe to this podcast. You can find us on most podcast listening platforms including your home devices by searching Drone Law Pro. Don’t forget to share this podcast on your social media and with your Part 107 friends. Until next time, fly safe.